Electric motors consume almost half of all electricity globally, with the annual spend of a whopping £370 billion. If numbers as big as these are involved, imagine how big the savings can be for your company. Many myths and doubts surround the issue of repairing motors. It has been suggested by some motor manufacturers that rewound electric motors lose efficiency. The most common assumption is that motors cannot be repaired or overhauled without reducing their efficiency and reliability; in fact, these can not only be maintained, but sometimes also improved. The efficiency of motors can be affected by a lack of maintenance and so regular maintenance may improve efficiency by up to 30%. While replacing electric motors can be the correct course of action in instances where the motors are incorrectly specified for the job (or for cost reasons on smaller motors), the advantages of repairing are cost-effective in the medium-term by increasing the MTBF (Mean Time Between Failures). 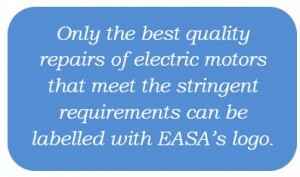 The electromechanical authority, EASA, is aware of these myths too, and is committed to providing advice to end-users so that they can make informed decisions with regards to electric motor repair or replacement. A survey conducted last year revealed that most industry professionals’ worst nightmare is unexpected downtime caused by motor failures, followed by concerns about safety considerations, quality and energy use. Despite the overall improvement of the quality of electric motors over the years, many still do break down regularly. The majority of the hundreds of survey respondents said they would be in favour of an independent certification programme for motor repair service centres. The EASA Accreditation Programme was then developed to provide clarity to end-users about the importance of proper motor repair and is a proof that motor quality can be maintained during electrical and mechanical repairs. The Accreditation can only be attained following a strict third-party audit, which guarantees the motor repair process can produce high levels of efficiency and reliability. There are 23 categories and over 70 mandatory criteria elements for a firm to meet. Centres are observed by auditors, as well as having their repair records reviewed. They need to be in possession of the correct equipment, have competent staff and use best industry practices to carry out repairs to the standard required. Applicable technical training is implemented to equip staff with extensive knowledge in order to provide customers with the best service possible. Numerous methods of training are used to achieve optimal results. How do accredited centres differ? Using the same meticulous procedures for each motor repair as part of the Accreditation results in an increased consistency as fewer errors occur. Certified centres also see a lower number of returns as the customers’ confidence in motors repaired by them grows. Well-trained staff can get their work right the first time and are more productive. All this means more benefits for you as the end-user, as the same high quality motor repair can be carried out for less. The annual cost of running a motor may be even ten times more than its purchase value. That’s why industry professionals recognise cost-efficient measures as crucial. As much as two-thirds of the UK industry’s electrical energy is consumed by motors. By having yours regularly checked, long-term energy-saving plans can be designed when wastage is accurately detected. Even before the Accreditation Programme started, CPM had already been practising our ethos focused on prevention over a response to a failure for over 25 years. We work by diagnosing the root cause of the problem, then repairing the product and finally testing it until we’re satisfied it works the best it can. We also advise our customers how to look after their motors to prevent similar issues from recurring. Such insight into the failure test results may prove extremely energy- and cost-efficient as precautions can be taken in the future. The motors we repair are labelled with EASA’s Accreditation logo and a CPM job number to enable full traceability. Our core ‘repair, replace, manage and maintain’ philosophy combined with EASA’s certification guarantees best industry practices are consistently being used. Only repairs carried out by a certified company can totally assure customers that their motor has been returned to its original manufactured condition. Using an Accredited firm is the safest option available. With a 99.1% reliability rate, you may decide you trust us enough already; but if you still don’t, search for us on EASA’s website here and discover the 70 reasons why you should. CPM’s auditors SGS Bassefa are renowned for their expertise in electric motors and are a world-wide authority on motors used in hazardous areas. Interested in provably efficient and reliable motor repair? Call us today on 0161 865 6161.